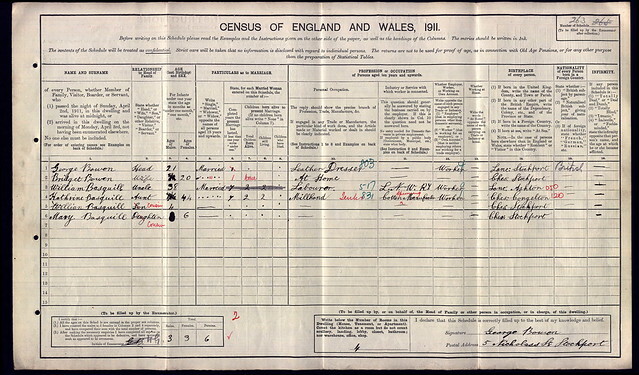 Source: 1911 census of England, 5 Nicholas Street, Stockport, Cheshire, England, William Basquill; digital images, Ancestry, Ancestry (www.ancestry.com/ : accessed 5 Nov 2017); citing RG 78 PN 1271, RG 14 PN 21367, registration district (RD) 443, sub district (SD) 4, enumeration district (ED) 19, schedule number (SN) 263. Rec. Date: 23 Sep 2017. I’ve written about William before. He was the son of John Basquill and Ellen Gillen, born in Ashton Under Lyne, England in 1872. The family moved to Stockport, England, and at the age of 14 William was signed up as an apprentice on the training ship Indefatigable, in Liverpool. He left after a couple of years and was indentured to the Peter Iredale company, to serve as a deck hand on the HMS City of Carlisle. While crossing the Atlantic, William was struck in the head with a clew iron and seriously injured. When the ship made port in Portland, Oregon, he sued the shipping company and the ship’s captain in U.S. District Court. He was ultimately awarded $1530 (about a tenth of what he’d sued for). All that is background information. He returned to England, where he joined the British Army in 1891. He was a life-long soldier. In 1904 he married Catherine Cohen, and they had two children, William and Mary. I found the family in the 1911 census, where William and Katherine are listed as the aunt and uncle of the head of household, George Bowen. Now, it may seem like that would be a simple relationship to sort out, but it was not! I spent the better part of a weekend tracing the various families of those present in 1911. I thought maybe the link was on William’s family’s side, which would make it worth pursuing, as I’m doing a one name study of the Basquill name. But no, it turns out that William was an uncle by marriage. The relationship was on his wife’s side. Catherine was the aunt of George Bowen’s wife, Bridget Melia. So I spent a weekend pinning down information that isn’t of much use to my own research, but too often that’s how it goes. Also this is a good reminder that sometimes you just have to get out the graph paper and pencil, because trying to mentally visualize the connections isn’t very helpful. And? I should mention that even though I had the relationships all sorted the weekend before last, I didn’t realize I’d actually made the connection until I put it on paper last Saturday morning.